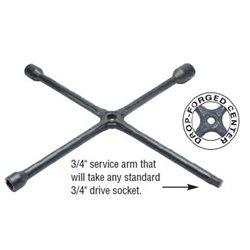 Heavy-Duty Truck Lug Wrench Socket Sizes 1-1/4", 1-1/2", 13/16" sq.,3/4" service arm square Ken Tool T95A / BOWES KT T95A. Use on heavy-duty trucks, buses, and tractors. Drop-forged or welded center provides strength and durability. T95, TM95,T95A, and TC95 wrenches have center hole for a leverage bar. Socket sizes provided fit most metric or SAE lug nuts on today's trucks. Stock: 1" (25 mm).